I’d had enough of being crammed in at Ardmore, it seems as though vehicles were jammed in everywhere with over 50 vehicles squeezed in and I guess with the motorhome show due to be held in Auckland later that week, people were starting to head on in to the city. Wednesday morning we had an early start as the van was having the underneath cleaned of surface rust and sealed so at 6.30am we were on our way, not too far to go though, just to Truck & Trailer in Spartan Road, Takanini. We headed off to get some breakfast whilst the van was being worked on, and to do some shopping and generally keep ourselves occupied. It was 1pm when we got the call to say that the van was finished and we could pick it up. Off we trotted, we got a thorough look at what they had done and came away feeling very happy, especially when the bill came in at nearly half of what we were expecting. We will be back here again if we need any work doing on the van as we were so impressed with them. They do all maintenance work on large vehicles as well as fibreglass repairs and they even do a polishing service. And to top it off they were really friendly and helpful. We had planned to stay the night at the Papakura Club however we decided to dump the tanks again at Bruce Pulman Park on our way. That’s when plans changed again. 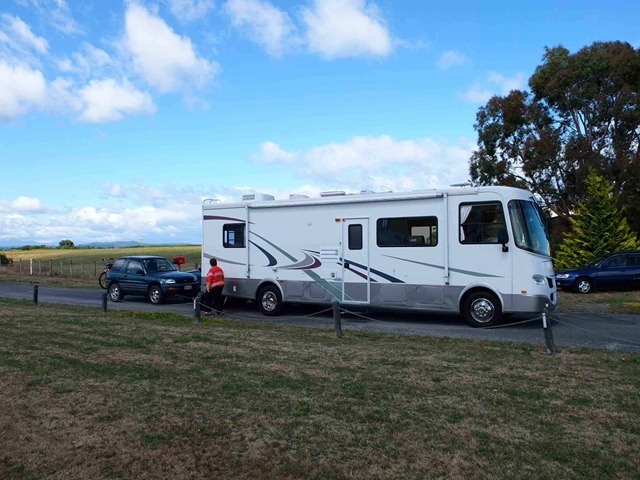 It just so happened that Antony had got us tickets to the netball being played at Pulman Arena that evening (also just happened to be our wedding anniversary) and as we saw a couple of motorhomes parked up, I went and enquired about staying the night there. the view from the door of the van, not too far to go to walk to the game. And at the same price as staying in an NZMCA Park, it was a no brainer to stay here for the night. After an early dinner we headed across the car park to the Arena to get our seats for the game, collecting goodie bags along the way from the sponsors inside the venue. It was a good game to watch and afterwards we sauntered back to the van and had a very quiet nights sleep. We were off the following morning to Hamilton where we ended up staying at the Car Museum, somewhere we had not visited before. Again it proved to be another very busy place to stay as we woke in the morning to find that we had neighbours move in on both sides of us both within spitting distance. Whilst at the museum we thought we should patronise the facility particularly as though the parking is free so we had lunch in the cafe. the outside of the museum building and the parking area before it became crowded. We placed our order for our lunch and were wandering around looking for a suitable table when out of the corner of my eye I spied a familiar couple of faces. I stood looking for a good minute or so desperately flicking through my memory banks to put names to faces before the lightbulb finally went off and I could go say hi. They recognised us straight away. It was Chrissy & Ian, they were longtime friends with my eldest brother Mike & his late wife Ann. Chrissy and Ann were school friends and we had met Chrissy & Ian a number of times over the years so it was lovely to see them and catch up. We also caught up with our long time friends Wade & Lindsay in the evening over a lovely dinner. It’s always good to see good friends. 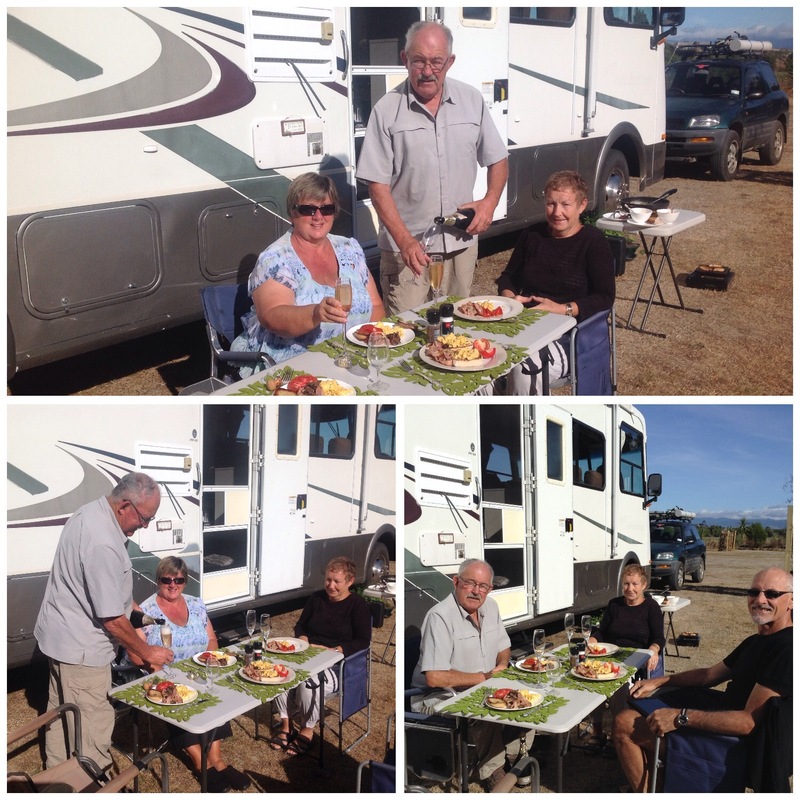 We also met up with Harry, Kim & family whom we had met a few weeks earlier at Shakespear. They had just been to have some solar charging issues sorted and were very impressed with the service they received from Wayne, so much so that we took his details so we could contact him at some point. The following day we took off to AJ’s Park on the shores of Lake Karapiro. the view through the front windscreen. it is a lovely spot to stay, relatively quiet and peaceful so we thought we’d stay a couple of nights, but a week later we are still here! The place becomes quite busy over the weekend, and we are kept entertained by waterskiers and kids enjoying themselves being towed behind boats on various devices from knee boards to biscuits. It took us a while to figure that there is no tide here, quite a change for us as we spend so much time near the sea. Sunday was an impromptu get together with a couple of my siblings – John & Jude called in on their way home to Whakatane, and Sue & Jeff joined us from their home not far away in Putaruru. This trip of ours is basically for us to catch up with my north island siblings before we head away to the UK, it seems we have started off quite well. Of course I forgot to take any pictures however it was a lovely afternoon with them all. I did take some pictures later in the week as we went into Putaruru on a few occasions to spend some time with Sue & Jeff and catch up on family matters including swapping genealogy notes. this is my sister Sue with the cheese & bacon scones she made one day for lunch……with the wrong mix she had mistakenly used from her pantry. Subsequently the scones were a strange sweet/savoury concoction 😂. And no, sweet savoury scones are not a new thing, they were relegated to the bin! Should have gone to Specsavers Sue 😘. Roy & Jeff tackling their respective crossword puzzles. 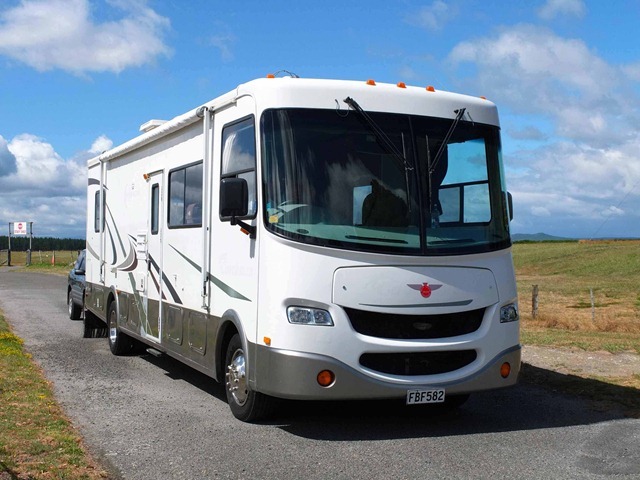 in between visits into Putaruru I had made contact with Wayne Hunt who specialises in motorhome electric/solar systems and it just so happened that he was going to be passing Karapiro on Tuesday morning and he offered to call in. Wayne & Vicki duly arrived and over a cuppa we chatted for some time before getting onto matters we wanted to sort. We want to be able to charge the van battery when we are stationary for any length of time. Wayne designs and builds systems and he came up with a couple of options for us, now we are all sorted with what will work for us. Once we get it, I will do a blog entry on that later. We also gleaned another couple of ideas from them whilst we were chatting so it proved to be a very good couple of hours spent in their company. We can highly recommend Wayne for anything solar/electric/motorhome related, especially as he explains things so well. Our departure day from here seems to be getting put back more and more, it may be tomorrow…but then again we may be saying the same thing again tomorrow! And who can blame us with this for a view. Ok, so we have started the year off very slowly in keeping up blog entries. Now we are back on the road, we should get ourselves back into some semblance of routine and ‘normality’. Dont hold your breath though! 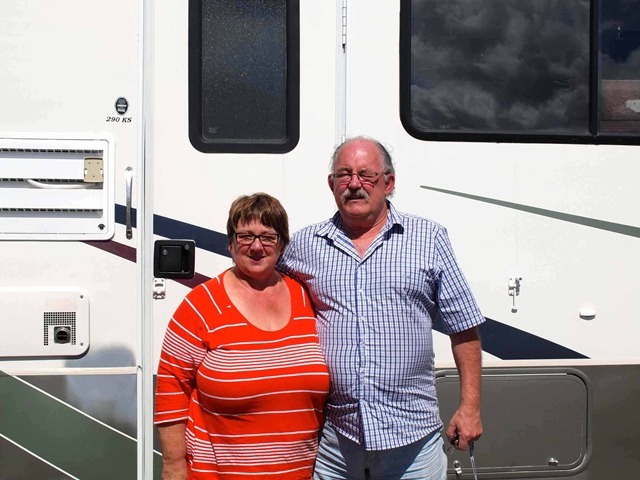 We finally left Auckland on Monday 14th January, Jacky & Chris arrived home from the UK late on Wednesday evening, they had Thursday at home before they left again Friday morning for a weekend with friends on Waiheke Island. Brother Mike arrived back on Friday as he was flying back to Dunedin on the Saturday completing his sojourn in the north. We spent the last few days in Auckland trying to remember if we had done everything we had wanted to achieve before we left the city. We had a quick trip over the the English food shop to pick up a few bits and pieces, including some bits for James at Pen-y-bryn. Whilst there, we took the opportunity to purchase a few goodies for ourselves! We also went to a few Asian markets, including a Korean mart and a Chinese Supermarket. Earlier in the week, we had been out for a Chinese meal along Dominion Road, Balmoral, where we chose one of the restaurants to eat at. We were the only European faces in the place, the staff spoke limited English, the menu was pictorial with some interesting English translations of menu items. We duly chose a couple of dishes, helped along by the waitress and proceeded to wait. Whilst waiting we were given a pot of green tea, it was delicious and refreshing, we polished off the whole pot in a very short time. Our meal duly arrived, and we are still unsure of what we actually ate, but it was all delicious. One dish was a pork belly dish with chillies (read that as at least 2 handfuls of dried chillies in the dish), on crispy rice. Another dish was a spicy lamb dish served with what they called pie, it turned out they were very soft dough-like pockets which you filled with the lamb….and of course I had to have some dumplings. It was all a bit too much for us so we ended up taking enough home for another meal. Which brings me back to the Chinese supermarket, we tried to find some green tea like we had had and even after ringing James to try and assist, Roy ended up back at the restaurant to try and find out what sort of tea it was. Through translations and hand gestures, it turns out that they import their own tea from China so we were unable to buy any in NZ, however, the kind lady packaged up a container full for us and gave it to us, free no less. Now we have our own supply. Whilst in Auckland ,we have also managed to see a couple of movies, the first was when Mike was with us when we went to see The Intouchables. A fantastic movie that we can all highly recommend, it is a French movie (subtitled) based on a true story. It is very, very funny and one I could happily watch again. The next movie was The Quartet which Bernice went to see last weekend by herself. It was a ‘nice’ movie, I would not rave about it however it was a nice way to spend a very hot afternoon in an air-conditioned theatre!! 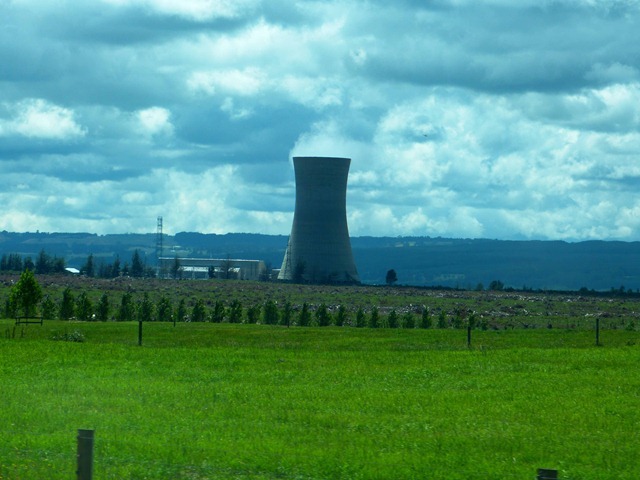 Monday morning, we left Auckland and headed to Putaruru, staying with sister Sue for the night. It was nice to get to sleep with cooler temperatures and half the humidity that we had been experiencing in Auckland. Roy’s cousin Robert called in for a catch up and we arranged to meet up with him again in a day or so. Tuesday and we headed off to Taupo and to our home which was safely parked up at Barry & Sandra’s base at Taupo airport. It was so nice to get back to our own bit of space and put away all our belongings. We called in to say hi to Jeff and Jason in Taupo before they headed off up to Putaruru. Tuesday afternoon and evening we spent at sister Hilary’s place, she had picked a few bags of plums so I helped her make plum jam and plum sauce. Wednesday and we spent the day with Robert, assisting him with his recent purchase of an iPad. Hilary and Rebekka came round in the evening for a final catch up before we left town. Thursday morning and pack everything up and get ready to move on, we go through our pre travel checklist to make sure everything is complete. and the crew ready to leave. 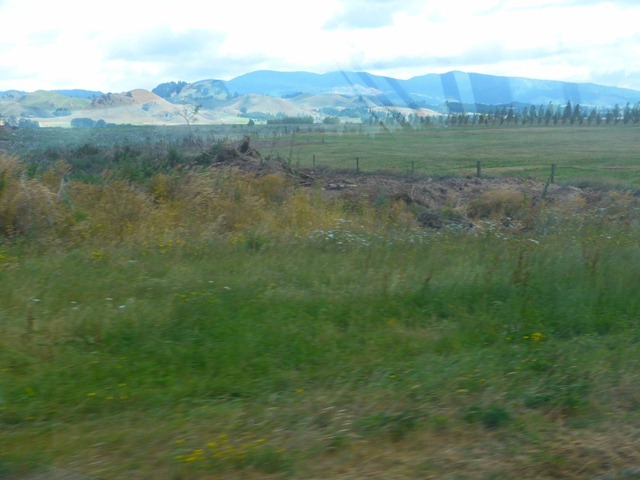 Now it is a few years since we headed through this part of country and it is interesting to see how the landscape has changed over the years. 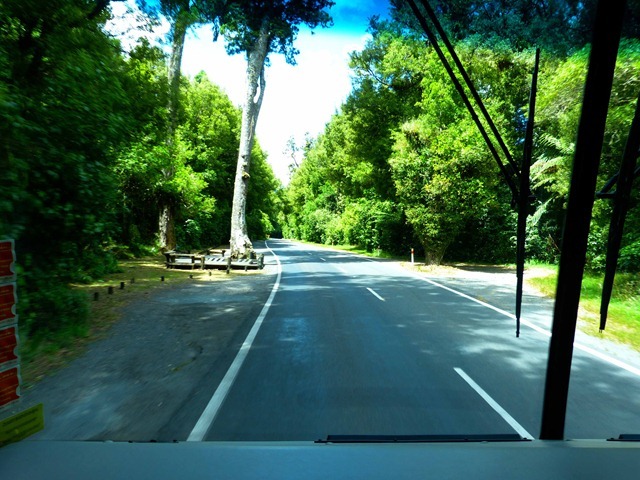 on the road past Wairaki, all of this land was covered in pine forest the last time we were through here. 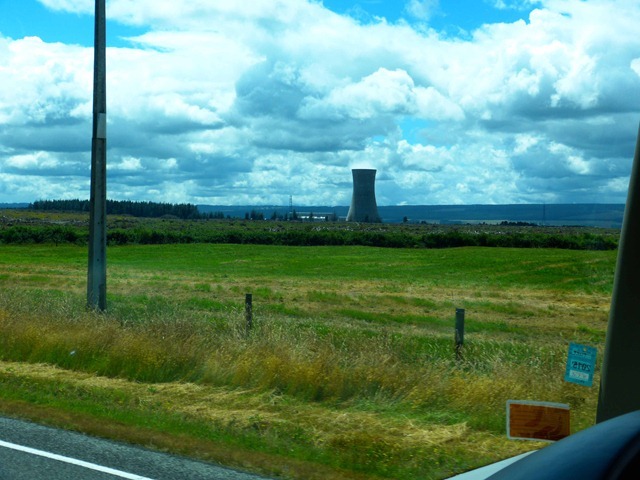 Seeing this cooling tower on the horizon reminded us of being in Britain, however, this is just out of Reporoa, and no it is not a nuclear power station but a geothermal power plant. We stopped in Rotorua to empty the waste tanks, then to fuel up the van as we noticed that petrol was 13c/litre cheaper in Rotorua than it was in Taupo and Auckland. Then it was off through past the Lakes to Whakatane. 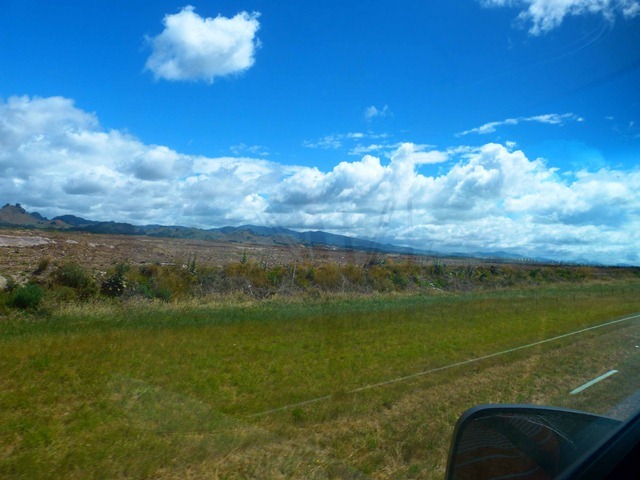 Along the way we drive through what is known as Hongi’s Track. Legend has it that the track was used by Hinehopu. She travelled regularly between her two homes, one at each end of the track. It was also halfway along this track that she met her future husband Pikiao II; the precise spot is marked by Hinehopu’s magic tree. Hinehopu planted the tree as a sapling to mark the spot. The tree is today more generally spoken of as the Wishing Tree. It was over this same track that Hongi Hika and his Ngapuhi army hauled their canoes in order to attack Mokoia Island at Rotorua. 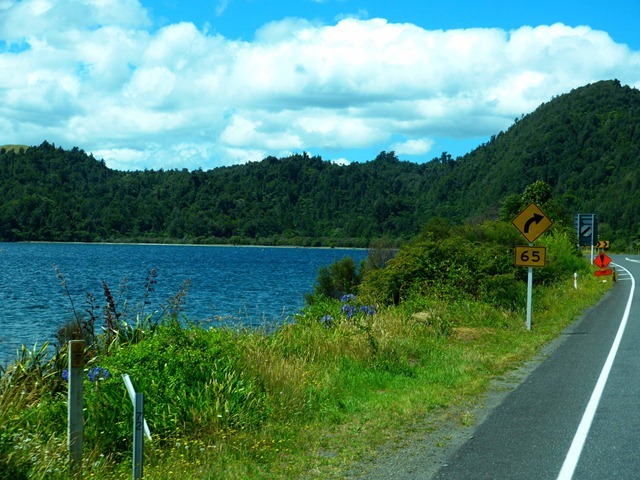 Much later, and probably as a result of a blossoming tourist industry, the roadway became known as Hongi’s Track. 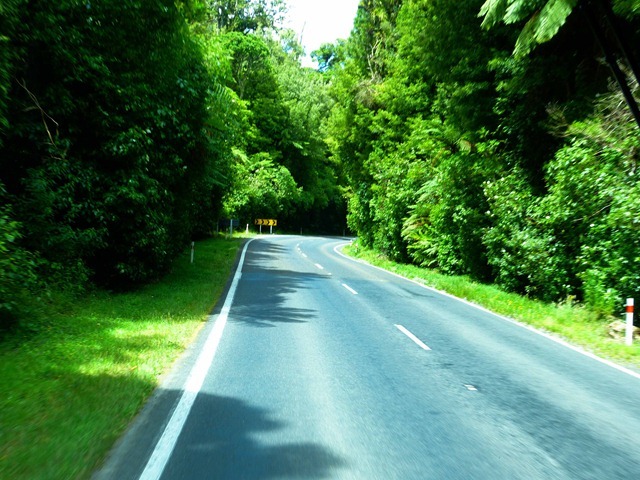 Today the highway follows the track and is serene and beautiful native bush. We stopped along side Lake Rotoiti for a bite to eat and a cuppa before heading to brother Johns place just outside Whakatane. Over the past week Bernice has managed to meet up with 4 of her siblings, next week we will also catch up with Steve. It has been fantastic to catch up with everyone. We are in the midst of planning a bit of a family get together in April as it will be 50 years since we emigrated to NZ from the UK, more on that in a later edition. Here we are parked up for the next few days with the hope that we will be able to get in a bit of fishing. Last night and John has some smoked fish which Bernice turned into a tasty smoked fish pie for dinner before she and his girls, Julie and Jenny, went off to the movies to see Les Miserables. Wow, I have been to three movies already this year, more than I have been to in the past 3 or 4 years!! !